Read this article from icons8. An infographic is a visual representation of information and is aimed at making an otherwise complex subject matter easier to understand. Icons8 is an app that delivers any icons the way you need them in 20 seconds. Read this informative and inspiring article from its website blog to know what is an infographic. Infographics have evolved in recent years to become a means of mass communication; they are designed to reach a wider audience by simplifying complex subjects and arranging it in an easy to digest format, unlike other types of visualizations. Because of its fair simplicity and a compelling storytelling, it has gained a lot of popularity in recent years, and we can see infographics being shared all over the internet and social media. But what is an infographic? To better understand the infographic definition, it helps to know where the term came from. Infographic is a portmanteau of ‘information’ and ‘graphic’. An infographic (information graphic) is a visual representation of information which aims to make the data easily understandable at a first glance. An infographic makes minimal use of text and can be a powerful tool for displaying data, explaining concepts, simplifying presentations, mapping relationships, showing trends and providing essential insights. The use of compelling images on an infographic can make what is an abstract idea that much easier to understand (hence infographics popularity in marketing and instruction). Infographics simplify large data sets providing a high-level view and making them easier to digest at first glance. They help convey data in a compact and shareable form. While infographics are often viewed as a novel, they were actually an early means of written communication as depicted by cave drawings and image-centric languages such as Ancient Egypt’s hieroglyphics. In the 1920s, pictorial statistics known as isotypes and a key precursor to today’s infographics were born. The onset of the computer and the internet has only expanded their use. Infographics come in various forms. They are categorized based on purpose, types of objects used and the flow of information. Note that an infographic will not always strictly fall into a specific category. Actually, most infographics will have elements of multiple types of infographics. The types of infographics that will be most appropriate in a given situation will depend on the objective of the data visualization. Choose the type of infographic that avoids ambiguity and best helps the reader extract actionable information and valuable insights. Are you trying to show the best and worst values in a data set? Is the goal to demonstrate changes and trends over time? Are you breaking down the subject item to illustrate its various components? Do you want to see the distribution of data? Are you keen on shedding light on the relationship between various values? Your audience matters too. For example, the suitability of a type of infographic can vary depending on whether the graphic is being presented to the company’s board members or its middle-level managers. Board members will probably only want to see the main highlights and not go into too much technical detail. Ergo, you may want to go with a simple infographic that doesn’t come across as crowded. We look at the most widely used types of infographics and share examples of each. The informational infographic is distinguished by its above average use of text when compared to other types of infographics. The graphic may be enhanced by icons, shapes, colors and other visual elements but overall, the emphasis is on the words. Timeline infographic depicts events or actions in chronological order. They are often used to demonstrate a product’s development, a historical trend or an idea’s evolution. Timeline infographic makes use of icons, images, and graphic elements to put the point across. The timeline’s format may be vertical, horizontal or winding. Vertical and winding timeline infographics are usually easier to read. A horizontal timeline infographic works best in posters, presentations, and environments where space is not a constraint. Сharts infographic has a chart as the centerpiece of the information visualization. Colors, shapes, and icons may be added for emphasis and/or explanation. Charts work best when performing a basic comparison of items. Instances where charts infographic would be relevant include the number of students in various universities, Twitter followers of different basketball teams or the population in select cities. 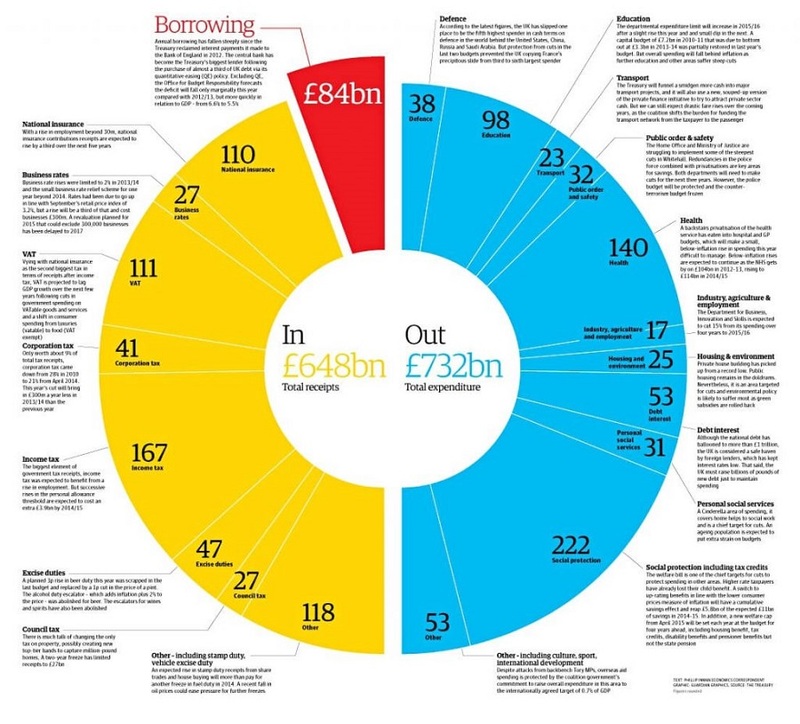 A pie charts infographic is one where the focus object is a pie chart. Whereas a pie charts infographic is technically a subset of a chart infographic, we assign it a distinct category given its widespread use. Pie charts are great for showing an item’s different components or how one value compares to several other values. How to infographic describes the steps involved in achieving a certain outcome. Examples of outcomes whose process could be portrayed using a how to infographic include a product’s manufacture, an ISO certification, a professional qualification or a medical procedure. The definition of this type of infographic inherently implies that each step is usually a logical consequence of preceding ones. Process infographic is similar to a how to infographic. The key distinction is that a process infographic depicts decision-making processes. Process infographics are also referred to as decision trees or flow charts. Each step is linked to the next with lines and directional arrows. Examples of situations where a process infographic may be applied include personality type determination, assembly line manufacturing, software programming, project planning and process audit. A comparison infographic examines the similarities and differences between two or more products, locations, events, actions, ideas or individuals. Examples of situations where this type of infographic may work include a comparison of Managers vs. Leaders, Insourcing vs. Outsourcing, or Past Strategy vs. Present Strategy. 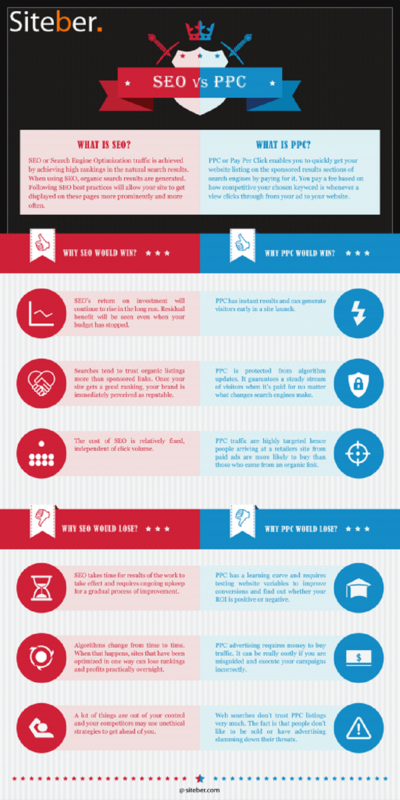 The comparison infographic creates a contrast and helps identify the pros and cons of one item in the context of an alternative. The graphic will usually be split into two or more sections depending on the number of items being compared. A number infographic is recognizable by the emphasis on numbers. Perhaps you want to show the various ways food is lost or wasted, how a war has impacted a given country or the vital numbers when applying for a mortgage. These examples and more can be well portrayed by a number infographic. The resume infographic depicts the work experience, professional qualifications and other credentials of an individual in a visual format. 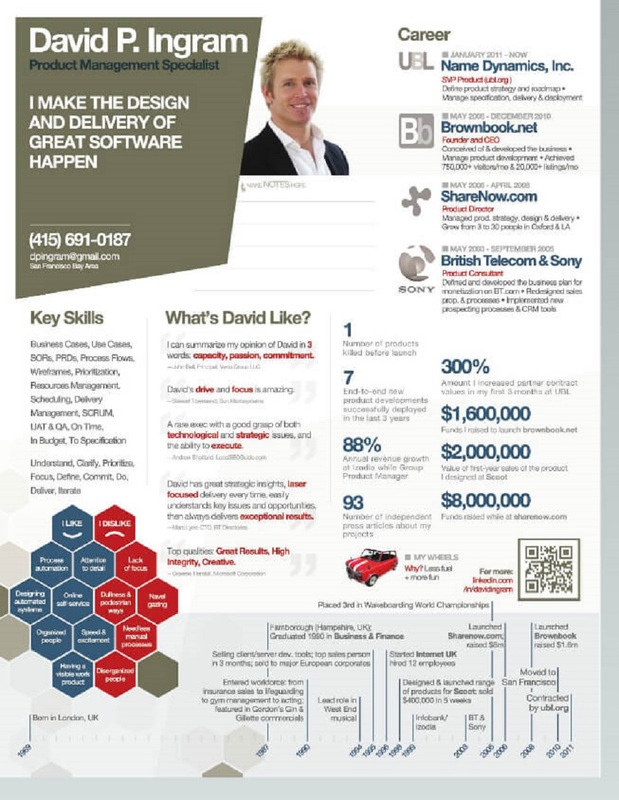 Most job ads will attract scores of applications so a resume infographic is a creative way to set oneself apart from other applicants. Whereas the resume infographic is often prepared as a summary accompanying a standard resume, it can stand on its own especially where the employer insists on a short CV. Job applications are sensitive so be certain that the infographic has a level of professionalism commensurate with the job applied for. Whereas there are different types of infographics, certain elements are key to making a visual representation of data qualify as an infographic. Virtually all infographics will make use of each of these to some degree. Colors are perhaps the most eye-catching aspect of an infographic so we’ll spend the most time addressing this topic. The color scheme you choose can make or break your infographic. Colors can either highlight or obscure information. There are a number of factors to consider and whose importance will vary depending on the nature of the graphic. For instance, if you are making an infographic comparing America’s major political formations, using red for Republican and blue for Democrat in line with convention would go a long way in making the graphic easy to understand. Another important aspect of infographic colors choice is differentiation. When comparing items, use colors that show a stark contrast between the two. Black and gray, for instance, would be poor choices in demonstrating how different two types of cars are. 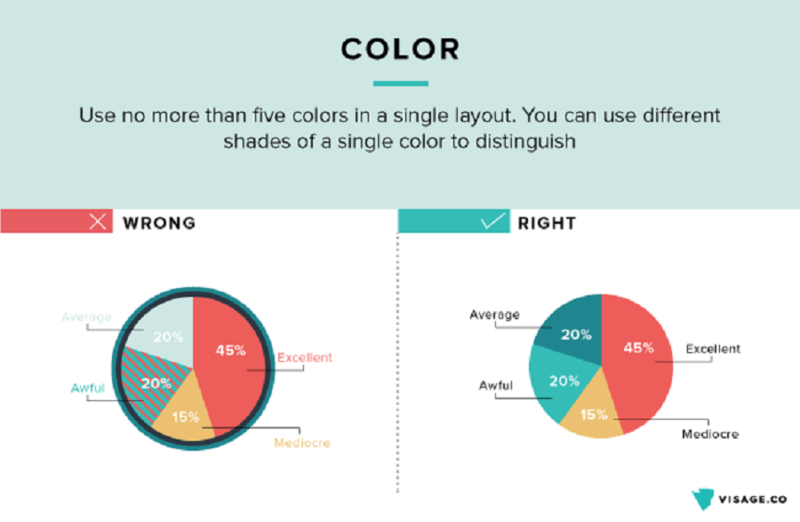 Take text color into consideration when choosing infographic colors. White text on a yellow background is a strenuous read. Choose colors in line with the background color of the page where the infographic will be posted. While there is nothing inherently wrong with placing an infographic with a white background on a website with a white background, it can make it harder for readers to see where the infographic begins. If the infographic touches on a brand, use the official brand colors as much as possible for consistency. Some colors evoke certain emotions and there is no harm in taking advantage of their existing connotation. Blue and red colors are thought to show stability and trust. That’s why the bulk of financial services brands (and hence their infographics) use these colors. Green goes well with environmental issues. Finally, keep things consistent. This does not only apply to colors but other elements as well. 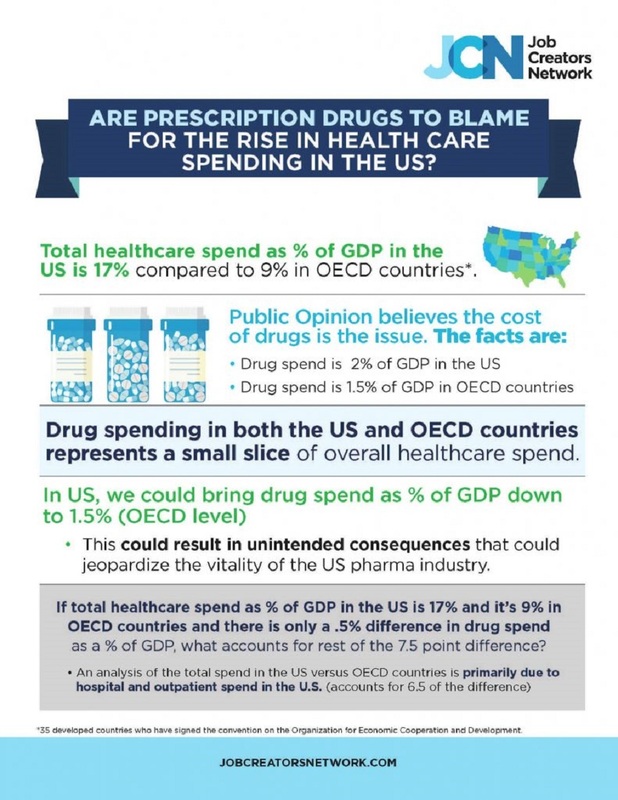 If you used a certain color scheme at the beginning of a series of infographics, you may want to stick to it in subsequent infographics on the same topic. That would make it easier for a reader to follow the story over time. Consistency applies within the infographic too. Don’t show an infographic element in one color at the start only to shift to a different color further down within the same graphic. The number of fonts has increased dramatically in recent years. There are now far more infographic fonts options than the usual Times New Roman, Arial, Calibri and Comic Sans. Fonts can be classified in several ways but many experts place them in four broad groupings: Serif, Sans-Serif, Script, and Decorative. Serif fonts (e.g. Merriweather and Times New Roman) have small lines attached at the end of each letter and are considered more formal. Sans-Serif literally means ‘without serif’ and these fonts (e.g. Arial, Helvetica and Lato) do not have the small lines. They are more streamlined and modern looking than Serif fonts. Script fonts have a handwriting feel and are seen as fun, casual or elegant. Decorative fonts have a novelty to them (e.g. the snowcapped fonts on Christmas graphics) and should be used sparingly and for specific subjects. Just like colors, not all font types will work with your infographic. 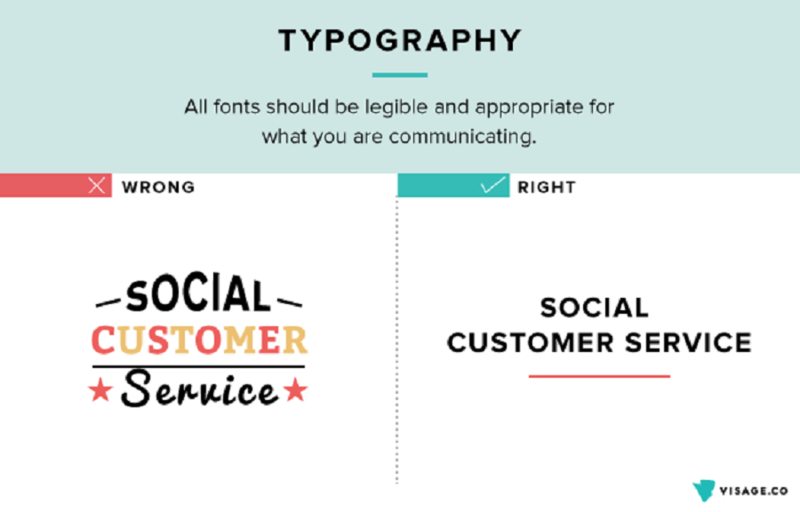 As a general rule, the infographic fonts you should use depend on the infographic’s overall theme. Comic Sans, for example, will not be ideal for the majority of business infographics. 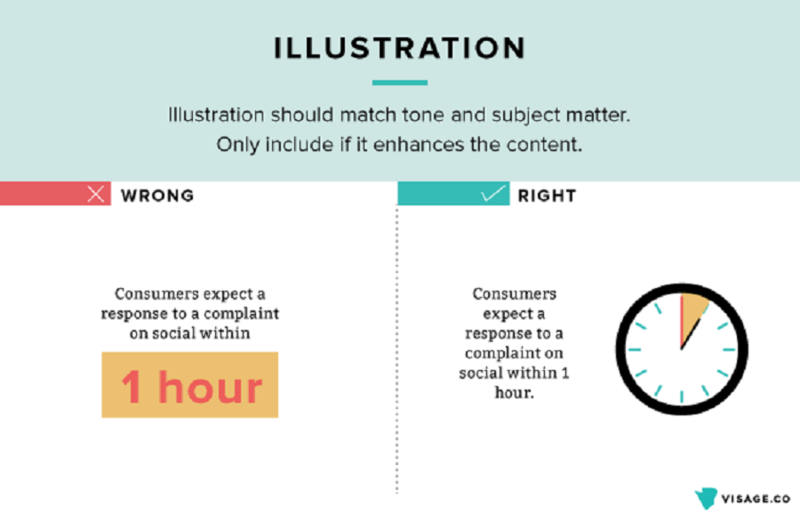 The infographic fonts you choose will give readers the first impression of the content and hints at how they should gauge the rest of the infographic. Your font could be saying “tropical vacation” when it should be saying “Lower Manhattan office”. Once you have established the purpose of your graphic, look through the infographic fonts you have available on your editor’s library. If working from your desktop, tablet or smartphone, you can download additional fonts from the internet. If you have already created an infographic on the same subject before, you would probably want to stick to the same theme. Whether it’s a brand and has a designated font, go with that. The type of font is not the only decision you’ll make on fonts. You’ll also want to choose whether to go with light, bold or italic versions of the font. Bold fonts are great for headlines and sections of the infographic you would want to draw the most attention to. Headers and sub-headers should have a larger font than the rest of the infographic. Remember that the inclusion of text in your infographic means you are keen on communicating an important message. The readability of the font is, therefore, a vital quality. Pay attention to how the text will be seen in different settings. Something that’s visible on a laptop may be difficult to decipher on a smartphone. Do not overdo it. The goal of the font is not to excessively dazzle the reader. Ultimately, you want a font that helps explain the content of the infographic in a subtle way and not one that becomes the subject itself. Infographic fonts should maintain a healthy balance between providing emphasis and remaining somewhat understated. Choosing the right infographic icons can make the difference between a verbose and winding visual, and an engaging and impactful one. Icons are sometimes taken for granted but can actually come in handy when packing plenty of information in small spaces. A single icon can replace a paragraph of explanations. There are a number of helpful tips that come in handy when choosing the infographic icons to use. Look for items that can be replaced with an icon. Is your infographic about different types of fruits? Replace each fruit name with its respective icon. Want to show a certain type of activity such as running or walking? There are icons for that too. 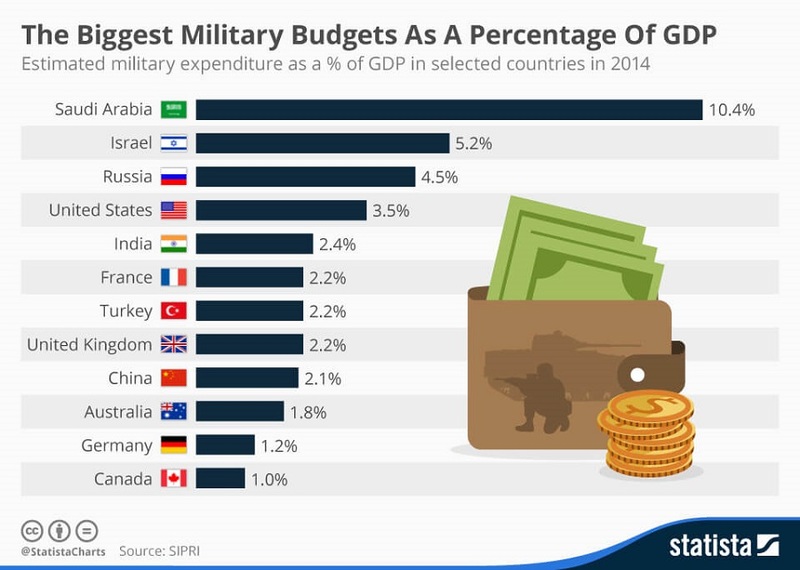 Use icons instead of legends to label a pie chart or the columns of a bar chart. For example, if you are comparing the attributes of different social media platforms, you can use the icon of each network instead. Correct icon use is distinct by the ability of the graphic designer needing little to no words to explain what the object represents. There is a wide range of infographic icons one can choose from that cover nearly any subject. If you are using an icon to represent the characteristics of a large population, setting each icon to represent 20,000 people may make it easier to read than having each icon depict 5,000 people. Even when infographic icons must be labeled, descriptions shouldn’t be wordy. Remember to match your choice of icons to the infographic’s overall color and font themes. 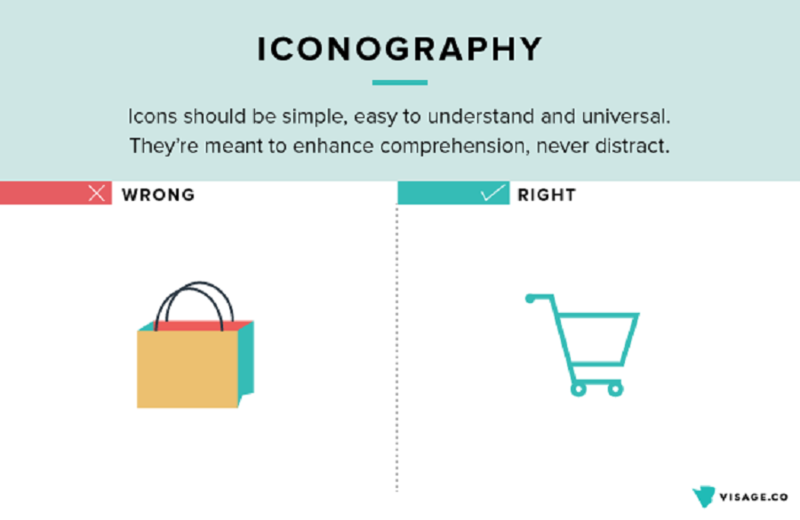 Like fonts, infographic icons shouldn’t be a distraction. They are a means of further explaining the infographic’s core message. Some of the basic rules around the use of icons apply to infographic images too. Images shouldn’t ‘take over’ the infographic else you risk reducing the graphic into a patchwork of images with a smattering of text. Images can replace what would otherwise have been acres of explanations. Make sure the colors on the image are consistent with the infographic’s color theme. 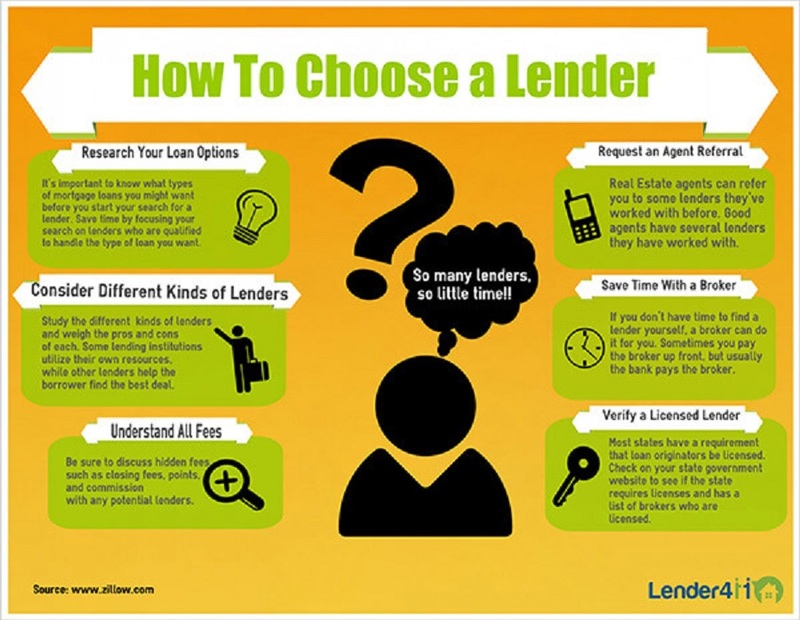 There are other additional considerations though when choosing infographic images. For starters, avoid clichés (also known as stock photos). Do not use images that have likely been seen by readers multiple times already on other infographics or websites. Even if the infographic explores an original idea, the presence of such images dilutes its impact and makes an otherwise exciting message seem boring and tired. Use animals and people to make the infographic more specific and personal. Go out of your way to ascertain that the infographic images are up-to-date and relevant. Do not use an image of a 1970s white collar worker on an infographic explaining the work environment in today’s office. It takes more than fancy images and catchy colors to make an effective infographic. The design element is crucial. There is a wide range of infographic tools available online. We look at the major ones. Piktochart has hundreds of templates to choose from though this does not prevent you from creating your own from scratch. New templates are added weekly. Infographic objects at your disposal include maps, charts, photos, and icons. 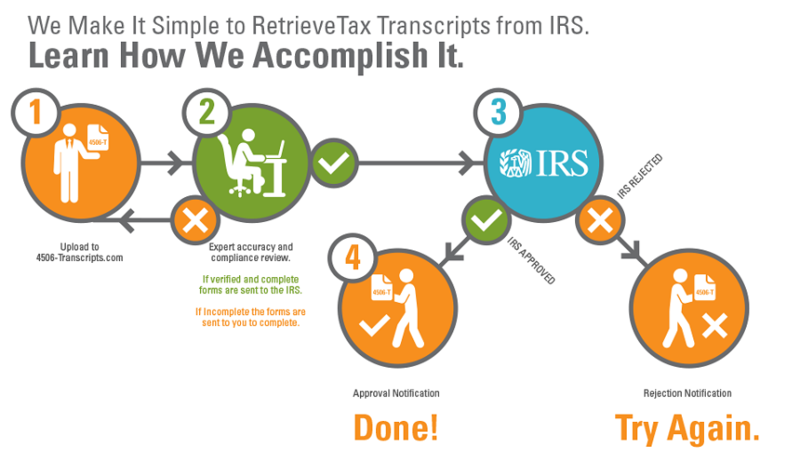 Import your data to Piktochart from Microsoft Excel, Google Spreadsheet or SurveyMonkey. 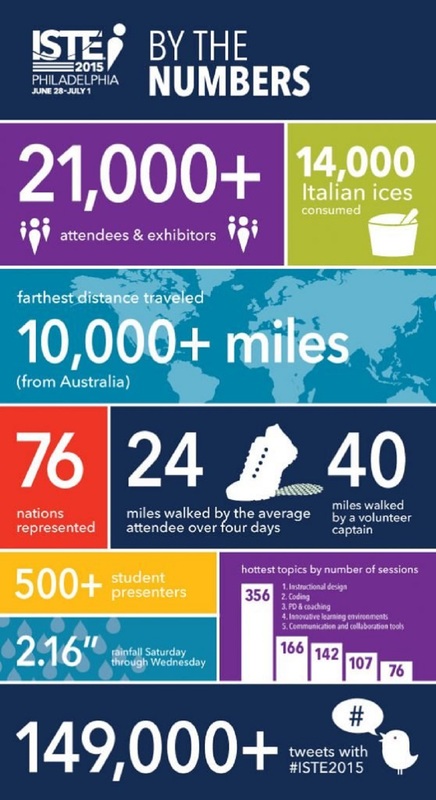 The completed infographic can be embedded on a website or downloaded and shared in PDF, PNG or JPEG format. Canva is a popular online design tool that has a vast inventory of templates. Canva has a user-friendly interface and is relatively easy to use even for persons without a tech or design background. Infographic elements such as icons, maps, and images, can be dragged and dropped into position. Leverage your creativity by customizing the infographic using the hundreds of thousands of available images and numerous layout options. While most other infographic tools can be used on a wide range of design projects including reports and slideshows, Venngage is focused on infographics. Through a couple of easy to follow steps, your infographic can be ready for distribution in a short time. Incorporate icons, maps and charts to create an impressive design. Venngage has relatively few templates (just over 100) which can be a problem for amateur designers. That said, Venngage has an advanced design option for greater control of the objects and graphics. The infographic can be shared on social media, embedded on the site, or downloaded as a PDF or image file. If you are looking to build an interactive infographic that features significant amounts of animation, Visme should be up there among your most preferred alternatives. Visme’s intuitive built-in animations can be activated when readers open a link to the graphic or scroll down the web page. You can lock the infographic with a password if you only want a limited audience to view it. This can come in handy when working on the infographic as a team and only want to share it publicly when the final copy is agreed upon. Easelly features a simple design layout and a range of infographic elements such as shapes, charts, and backgrounds. The free templates number in their thousands which is significantly higher than those available on many other infographic tools. As the name implies, Easelly is easy to use. It’s ideal for students, educators, and business executives who intend to convey a concept, plan or product. The final infographic can be downloaded in PDF or image format. Infographics have become a powerful tool for analyzing large data sets and explaining information. In times past, creating an infographic was the preserve of a select few due to the high cost of software (such as Adobe Photoshop) and the complexity of the design process. With numerous low-cost (or free) and easy to use online tools now available, it doesn’t take as much time and effort to come up with a quality infographic. Infographic tools are often packed with plenty of templates but that should not prevent you from mixing different infographic elements in order to create a unique design.